Think of Sustainable Live*Work*Play as your very own one-stop resource of must-have tips and finds for more sustainable ways of living and doing business...with a personal touch. Most picks are tried and true favorites, many are healthy or green, and all try to help you walk the talk in a way that makes sense and works for you...in your life, your work, your play. And here's a promise...there are no sustainable, eco, or green police here. No one to tell you that you're doing it wrong or that you're not green enough. Given Mavenjoy's roots in the guilt-ridden, guilt-giving South, Sustainable Live*Work*Play has been declared a guilt-free zone! ...and give others the chance and benefit of the doubt to do the same. The hope is by simply putting more sustainable options at our fingertips and introducing the ideas and people behind them, we will pause to consider the potentially positive impact in all we do -- from the life we lead, to the work we choose, to the play we enjoy -- and then choose to better support those helping us do it. as your very own one-stop resource of must-have tips and finds for more sustainable ways of living and doing business...with a personal touch. Most picks are tried and true favorites, many are healthy or green, and all try to help you walk the talk in a way that makes sense and works for you...in your life, your work, your play. What if each choice offers us an opportunity to make a positive impact? What if we connect what we choose to do with our time, our money and our livelihoods with a broader understanding of how these choices impact the world beyond just the one we inhabit? These questions and their answers help us understand what sustainable living means and how we can begin making a positive impact - economically, socially, and environmentally - one choice at a time. 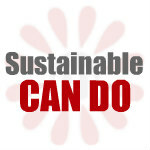 The good news...options for sustainable living exist for just about everything we need, want and can dream up today. Along the way, I ditched the rat race for living more simply and somewhere special sooner rather than "some day" with the three loves of my life (one 2-legged and two 4-legged), and doing work I believe in and absolutely love. And I've been hunting and gathering more sustainable alternatives for everything from credit cards to cookware in my personal life, and small business financing to jobs in my professional life. And so it is that Mavenjoy Media came to be and has created this Sustainable Live*Work*Play resource to shine a light on solutions for everyday issues that make a difference to you, others and our environment. Mavenjoy scours the offline and online worlds to discover the people, products and ideas that help us live well and do good. And we especially thrive on sharing with you these handpicked finds that are contributing something extra-special to the world. Why? Because they're pretty darn cool, they've earned a shout-out, and you deserve to know about them. So...how about sustainable options for things we like to do, have to do and didn't even know we could do? Mavenjoy guides you to the answers to these questions and more by sharing resources, best practices and even personal eurekas for the best in sustainable living choices.